So.. 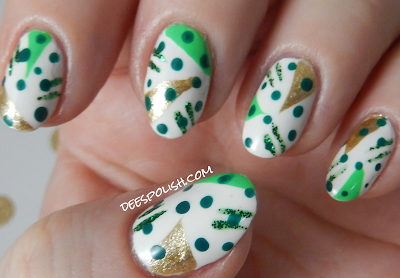 I inadvertently created 80s-esque St. Patrick's Day nails. Now, I was going to remove them and try to make something more.. pretty.. but let's be real here: I love the 80s vibe. They get to stay! I started by doing triangle chunks of colour - based off of a photo from IG. Then.. I was going to add a third colour of chunks, but went with glitter mini-stripes, and dots to top it all off. I just.. yup.